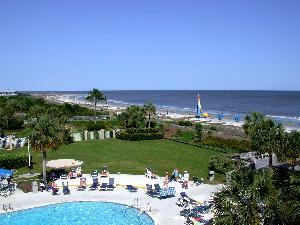 ResortQuest offers St Simons Island vacation rentals to accommodate those attending The 2007 Georgia Sea Islands Festival, held June 16 - 17 and presented by the St. Simons African American Heritage Coalition. The 2007 Georgia Sea Islands Festival, held June 16 - 17 and presented by the St. Simons African American Heritage Coalition, honors black history and the Gullah/Geechee way of life. Featuring entertainment by the famous Sea Island Singers, The Baconton Praise and Worship Singers, The Glynn County Steppers and other local singing groups, as well as the traditional "shouting" of the Gullah/Geechee people, storytelling, dancing, crafts and food, the festival will celebrate and preserve the history, culture and customs of the African Americans who inhabited Georgia's islands. Being held near The Village on St. Simons Island, the festival's hours are from noon to 7 p.m. on Saturday, June 16 and from noon to 5 p.m. on Sunday, June 17. For more information about this event, call (912) 262-6934. ResortQuest, one of the nation's leading vacation rental hospitality and resort real estate companies, provides a one-stop resource in North America's premier resort destinations, ResortQuest.com. ResortQuest is the largest marketer and management company of vacation condominiums and leading vacation rentals in the U.S. and Canada, based on a portfolio of nearly 17,000 properties, from Hilton Head rentals to a Fort Walton Beach condos, with a combined real estate value estimated at approximately $7 billion. ResortQuest Real Estate is one of the nation's leading real estate companies focusing exclusively on resort properties, offering superior brokerage services in the country's premier beach, ski and golf destinations. ResortQuest employs more than 4,000 people and is owned and operated by Gaylord Entertainment Co. (NYSE: GET), one of the largest and fastest growing companies in the hospitality and entertainment industries, based in Nashville, Tenn., that also owns and operates Gaylord Hotels and the Grand Ole Opry. For more information, visit ResortQuest.com or GaylordEntertainment.com.